January’s Patient of the month is a lovely young kitty named Willow Macdonald. Willow came to Oak Animal Hospital mid-January with some worrisome symptoms. The 14 week old kitten had begun sneezing and coughing up blood while her owner was out of town. Her concerned pet sitters brought her in for an exam immediately, at which point it was determined she had a fever. Her pet sitters decided to take her home and monitor her closely for the evening. Willow returned the following day, as her symptoms were not improving. 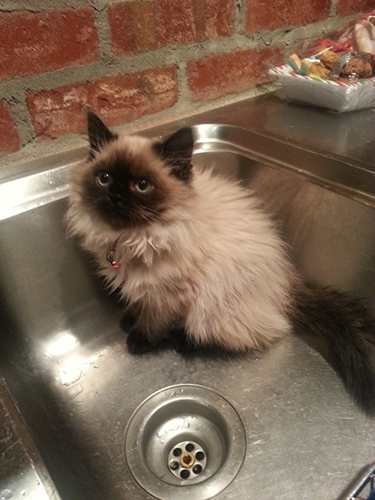 Her pet sitters then decided that they would like to pursue diagnostics for little Willow. Digital x-rays were done in house immediately,revealing that poor Willow had what appeared to be a large sewing needle stuck next to her tongue. After some pre anesthetic blood work was completed, Dr. Dhillon went ahead with an endoscopy to attempt to remove the needle. The needle and some thread were successfully removed, and Willow has done exceptionally well ever since. This little kitty put on such a brave face throughout her whole ordeal and was a pleasure to have stay with us at the hospital.